I think I am somewhat fortunate to work for an organisation that is well-equipped technology-wise, with many classrooms having enough computers for every student. This enabled me to start experimenting with real-time assessment apps a few years ago, initially with Qwizdom and then InfuseLearning, which was a particular favourite of mine. Sadly, InfuseLearning was a little ahead of its time and ended up shutting its doors in April 2015, just as many students started to own smartphones with Internet access. Two of the most popular real-time assessment apps at the moment are Kahoot! and Socrative, with each having features that set themselves apart from the other. Real time assessment applications have become a viable alternative to classroom computers in my organisation only in the last couple of years. This has been the result of the increase in the number of students who own smartphones with Internet access and the increasing availability of reliable and affordable connections to the Internet via mobile devices. This is often referred to by the acronym BYOD, which is short for Bring Your Own Device. This has enabled mobile phones, something that is often seen as a distraction in the classroom, to be used as a tool for engaging learners and enhancing learning. On the surface, Socrative and Kahoot! are similar in that they enable teachers to create quizzes that are played in real-time in class. However, that is where the similarities end. Socrative has a polished, formal feel to it, with options for students to either attempt each question at the same time at a pace controlled by the teacher (teacher-led), or alternatively students can go through the quiz at their own pace (student-led). Kahoot feels more fun and informal, with a bold colour scheme, background music, a time limit for responses and a points tally that reflects the speed at which students respond. This gives quizzes a sense of urgency and excitement. 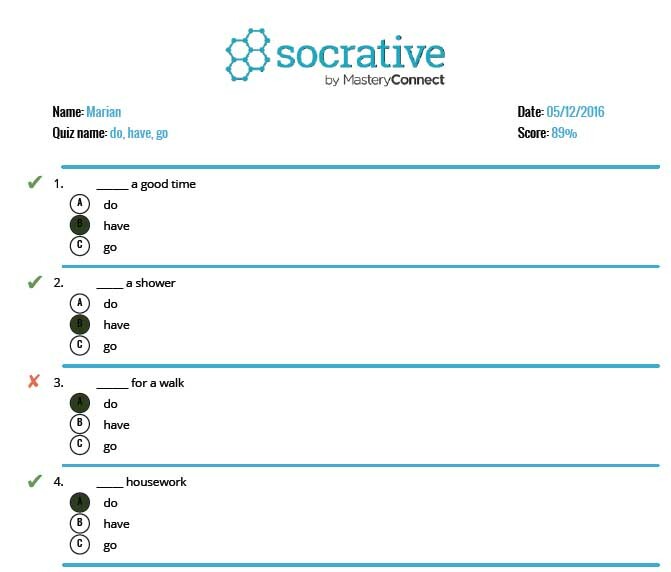 Both apps have solid reporting of quiz results, which are automatically saved, although Socrative looks more polished and offers a wider range of reporting options, including an online table and individual reports for each student in pdf format. Although Kahoot! is limited to multiple choice questions, it offers an extensive library of user-created quizzes that can easily be accessed. At the time of writing, there are over 8 million Kahoots! that have been shared by users, covering just about every subject under the sun. In stark contrast, Socrative only has around 2,000 shared quizzes and the implementation of the content can only be described as abysmal, with content being listed on a Google Docs spreadsheet and users having to enter a ‘SOC number’ in order to access a shared quiz. I cannot emphasise enough how great Kahoot!’s quiz library is for time-poor teachers who don’t have the time to create their own quizzes. Plus, what’s the point in trying to reinvent the wheel when someone out there has already made a quiz that fits your purpose. Quizzes created by other users can be conveniently saved to your favourites list for easy access and can also be ‘duplicated’, enabling you to edit it (I have done this to correct the occasional error that I have noticed in quizzes and also to change the choices in a question to something I feel is more suitable for my students). Just to give you an idea of what’s available, I have used quizzes created by other users on homophones (to, two, too), zoo animals, clothes, word formation, extreme adjectives, phrasal verbs and rounding numbers. I have been using Socrative for a number of years, but I currently use Kahoot! more regularly because of its extensive quiz library. If I had more time to make my own quizzes, I think I would prefer Socrative, with its wider choice of question types giving it the upper hand pedagogically; multiple choice questions tend to discourage independent thinking. 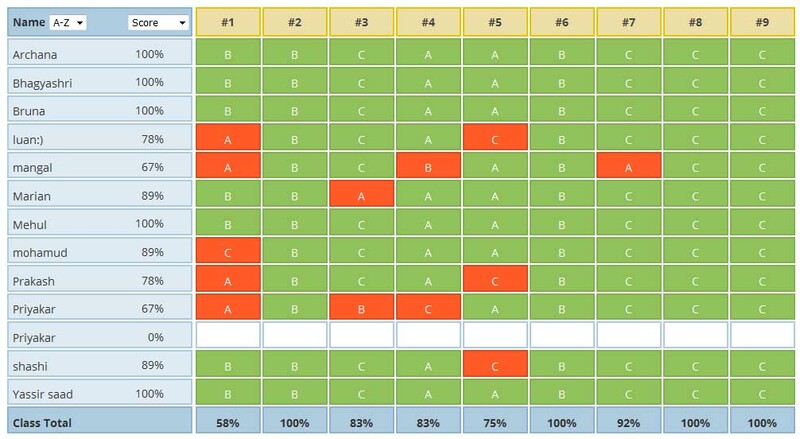 The availability of the short answer in Socrative enables deeper learning and understanding to be assessed. Real time assessment applications are great for student engagement and creating a buzz around what would often otherwise be relatively mundane activities, such as practising English grammar. A possible drawback that I have experienced with some of my learners is that those who are particularly competitive may see the activity solely as a game and focus on getting the highest score, rather than thinking about the questions posed, especially with the ‘play again’ option.